Northwestern researchers will study the effects of living in space for a year by studying a set of twins. 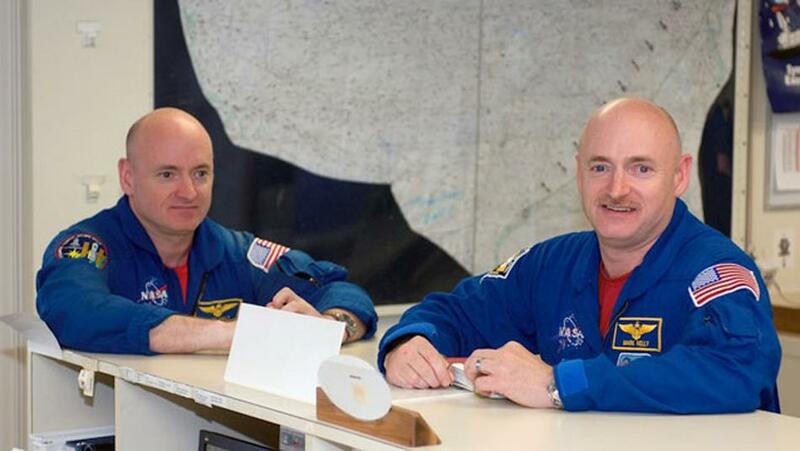 Scott Kelly (left) will spend a year in space while his twin brother, Mark Kelly (right), remains on Earth. Northwestern is leading a team of researchers to study the impact of living in space by observing two twins — one who will spend a year at the International Space Station while the other stays on Earth. The space shuttle carrying NASA astronaut Scott Kelly left Friday afternoon. Approximately 60 NU professors and students gathered at the Frances Searle Building to watch the live stream of the launch. Scott Kelly is scheduled to stay in space until March 2016 and will become the first American to stay in space for more than 215 days. Kelly’s twin brother Mark Kelly, a retired astronaut, will remain home to be part of a NASA-coordinated study conducted by NU and other universities. Mark Kelly is the husband of former U.S. Rep. Gabrielle Giffords from Arizona. NU is part of one of 10 research teams that will each study an aspect of the twins’ health. NU will collaborate with Rush University Medical Center and the University of Illinois at Chicago to study the effects of an extended stay in space on bacteria in the human gastrointestinal tract. “Anybody that’s taken antibiotics and had that produce an upset stomach has experienced what happens if the bacterial populations in the gut get out of balance,” said Neurobiology Prof. Martha Hotz Vitaterna, one of the researchers on the study. She said there may be an overgrowth of inflammation-producing bacteria, because antibiotics can deplete friendly bacteria. “We are looking at those kinds of bacterial population balances in the two twins,” Vitaterna said. Two medical samples were collected from the Kelly twins before last Friday’s launch. Vitaterna said there will be three more sampling times while Scott Kelly is in space, followed by two more after he returns to Earth. She said analyses in trends will not be possible until all 10 teams have completed their research and can integrate all of the data. Researchers hope the study will allow them to better predict the effects of extended time in space on future astronauts, creating an “early warning system,” Vitaterna said. NASA Deputy Program Scientist Craig Kundrot (Weinberg ‘82) said although NASA was initially hesitant to use such a small sample size, it decided that the opportunity was too unique to pass on. Kundrot, who will coordinate the 10 investigations on the Kelly twins, said the research will focus on four main categories: molecular, physiological, cognitive and microbiome-related. “To our knowledge, no one is doing such a disparate range of things in a coordinated manner,” he said. Peng Jiang, a postdoctoral fellow in the NU Center for Sleep and Circadian Biology, said the scale of the data is expected to be huge. “We have multiple time points, multiple samples, and then when you have those samples, what you’re going to do is extract all the DNA from the sample,” he said. Jiang said modern DNA sequencing techniques will allow the team to identify and characterize the composition of the microorganism species that exist in the digestive tracts of the astronauts. Kundrot said one aspect of microbiome changes that the Chicago team will study is how the environment in space affects the human body. Kundrot said he’s interested to see how the lack of diversity in the environment is going to affect gastrointestinal health. Vitaterna, the NU professor, said the research is unusual because it only focuses on one pair of twins rather than a large experimental group.